I’ve always been amused by the designs on playing cards. They seem simple at first, but when you look closely you realize the image is a combination of smaller mirrored portions of the design. This mirroring is creating a kaleidoscopic effect, which keeps our eyes and mind busy and entertained. In this tutorial, I will show you how to use these simple effects in order to create an impressive multi-functional design. This design can work on any rectangular working area, but let’s try to do it on a traditional landscape-oriented poster template. Set the new document profile to Web and set the Width at 800 px and Height at 1100 px. Try to create some simple geometric shapes. Do them on the side next to the artboard. I did the four playing cards symbols (spade, heart, club, and diamond). I also made a few others such as cloud, raindrop, thunderbolt, ghost, rainbow, etc. We will need to rasterize the sketches. Select the group of sketched objects and go to Object > Rasterize. A dialog box will appear. From the Resolution menu, choose Medium (150 ppi). When using the Pen Tool, try not to add many anchor points. This way your lines will be smooth and you can create shapes with sharp edges, which are great for our task. Let’s use some basic tools so we can make some more geometrically accurate shapes. Using the Ellipse Tool (L), draw two circles over the cloud sketch. Arrange them so that they cover the upper part of the cloud. Open the Pathfinder panel (Shift-Control-F9). Select both of the circles and use the Unite command. After you merge the two circles, draw a rectangle using the Rectangle Tool (M) and place it on the lower half of the merged circles. Select the two shapes and use the Minus Front command from the Pathfinder panel. The final shape should look like this. Moving on to the raindrop shape, it can be easily made by combining two different shapes: a rectangle and a circle. Use Pathfinder’s Unite command to merge these two shapes into one raindrop. The same goes for this shape. Combine a circle and, using the Pen Tool, draw a “tail” shape which you can later merge with the circle, using Pathfinder’s Unite command. The next object is a pixelated ghost. Start by drawing a rectangle for the body. Use the Rectangle Tool (M) and add two smaller rectangles for the hands. I did them in red so that readers of this tutorial won’t get confused. Use Pathfinder’s Unite command to merge them into one object. Add two long, portrait positioned rectangles in the lower half of the body. Use Pathfinder’s Minus Front command to cut out their shape of the body. This way, we will get three extensions as legs of the pixel ghost. Ultimately, draw two squares and position them as the ghost’s eyes. 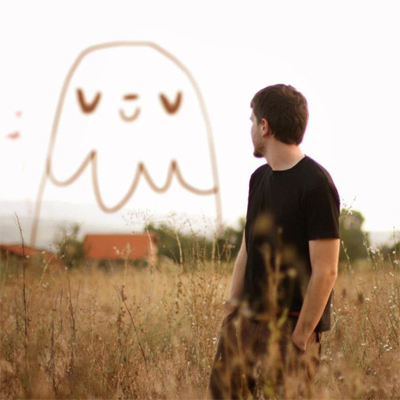 Our ghost should look like this. Moving on to the next object: rainbow-like lines. Using the Ellipse Tool (L), make three concentric circles. Select the Direct Selection Tool (A) and select the bottom half of the three circles. Press Delete. You should get rainbow-like lines. Give them stroke thicknesses of different values, starting from the inner one. Make the next stroke thickness value twice as big as the previous one. So for example, if the inner one's thickness is 5 pt, the middle one should be 10 pt and the outer one 20 pt. Select them all and go to Object > Expand. In the Expand window, check only the Stroke option. After the lines are expanded, swap the fill and the stroke (Shift-X). Let’s do another one. Select the Ellipse Tool (L) and click anywhere on the artboard. In the dialog box, enter 170 px for both Width and Height values. Select the Direct Selection Tool (A) and select the left half of the circle. Press Delete. You will get a semicircle. Make the stroke weight 55 pt. Select the semicircle and go to Object > Expand. In the Expand dialog box, check only the Stroke option. Swap the fill for stroke (Shift-X). Select the object and go to Object > Path > Offset Path. A dialog box will appear. Make the Offset value -23 px. Leave the other options as they are. A new half circle will appear inside, only a smaller and thinner one. We are done with this one. The rest of the shapes I did are quite simple and they require combining the Rectangle Tool and the Ellipse Tool, and of course, the inevitable use of the Pathfinder command. Now let’s go back to the artboard. Make sure your Rulers are visible (Control-R) and the guides are also visible (Control-;). Draw a vertical guide in the middle of the artboard, and another horizontal one, also in the middle point of the artboard. They should intersect right at the artboard's middle point. Our working area will be only the upper left quarter. Do another sketch which will build the structure of the design. You can make a circle in the middle of the artboard which we will use as a face, and a few curved lines in the upper left quarter. We will again need to rasterize the sketches. Select the group of sketched objects and go to Object > Rasterize. From the dialog box, choose Medium Resolution (150 ppi). Drop the Opacity to 40% and Lock (Control-2) the traced image. To get geometrically correct lines, we will use the Rounded Rectangle Tool, which is located in the same spot as the Ellipse and Rectangle Tool. Click on the working area and a dialog box will appear. Enter the following values: Weight: 400 px, Height 550 px, Corner Radius: 84 px. Select the Direct Selection Tool (A) and select the top and right part of the rounded rectangle, including the edges (I marked that part in red). Press Delete. Position this line over the sketch. Now let's move on with the other similar lines. Use the same process to create few more curved lines. Position them over the sketch. For the final line with a spiral ending, select the Spiral Tool, which you can find next to the Line Segment Tool. Click on the artboard and in the dialog box enter the following values: Radius: 40 px, Decay: 80%, Segments: 10 and choose the second style. Keep the spiral selected. Find and double-click the Rotate Tool (R). In the dialog box, enter -90o for the angle value. Click OK. The spiral will rotate 90 degrees clockwise. Select the Direct Selection Tool (A) and select the last anchor point on the outside of the spiral and press Delete. This way, we will make the spiral shorter for one segment. Use the Pen Tool (P) to draw a straight vertical line from the end point of the spiral. Place the spiraled line at the top of the sketch. Select all the lines we just created and give them Stroke Weight of 7 px. This way they will look the same and we will achieve a feel of unity. For the central face object of the image, we will need a simple circle. Select the Ellipse Tool (L) and click on the artboard. In the dialog box, enter 270 px for both values, Width and Height. Using the previously used technique, we will create the eyes and the mouth by cutting circle shapes in half and adjusting their stroke sizes. You can give the eyes a stroke value of 20 pt and the mouth 10 pt. Once you are done, you can unlock the sketch layer (Alt-Control-2) and delete it. Now, start arranging the shapes in the upper left quarter of the artboard, which we already defined. Try to make a sort of a border by multiplying the objects you are using. It’s very important to add some objects over the guidelines, where the guideline will pass exactly over the half of the object and will split it into two equal, symmetrical parts. You can clearly see how I made that with the circles and the Xs over the horizontal guide, or the circles and the diamond shapes over the vertical guideline. These shapes will be very crucial over the next few steps. Keep filling the gaps between the objects. It’s like building a design using toy bricks—I always find this game of juxtaposition fun and challenging. And finally, if you notice small gaps in the composition, try to fill them with a few more objects. Try to use few colors. If you want to use more colors, I suggest using shades of those few colors. For example, I chose shades of blue and red. I usually make the palette accessible by making little circle shapes colored in my palette of choice. I also label them so I can easily find the one I need. I place them next to the artboard. Start applying the colors. We can start with the dark red and move towards the bright one. Select any object and with the Eyedropper Tool (E) click on the circle with dark red color. Repeat the eyedropper color selection step for all the other shapes, using all the shades of red and blue. Color the eyes and the mouth of the face in the center in white color. The design should look like this. I spotted an empty space below the spade object. So we can add some small objects, let’s say circles, to fill this gap. Add four different colored circles in that area. I believe this quarter of the artboard is done. Let’s multiply it on the rest of the artboard. Select the whole design without the smiley circle in the middle and Group it (Control-G). Copy it (Control-C) and paste it. Then, selected the pasted group and go to Object > Transform > Reflect. In the dialog box, check the Vertical Axis option and click OK.
Place the pasted group in a way where both groups overlap—in this case it's the circle and diamond shapes. You should get a symmetrical composition, and if we did it right, it should match flawlessly in the middle. You can check that by zooming in on the overlapped groups. Now, copy the two groups we made and paste them. Again, go to Object > Transform > Reflect. In the dialog box, this time check the Horizontal Axis option and click OK. Align the two new groups where the shapes meet and overlap. Try to position them as accurately as possible, to get this awesome kaleidoscope effect. Just to shake things up, we can replace the corner spade shapes with the rest of the playing card signs—heart, club and diamond. This will break the perfect symmetry, but it won’t disturb the balance in the design. I suggest that all designs or illustrations should have some space around them, to give them some breathing space. To do this, simply select the whole design and double-click the Scale Tool (S), and in the dialog box check the Uniform option and enter 90 as its value. Also make sure that the Scale Strokes and Effects option is checked. Click OK. You can see the notable difference with the free space around the whole design. Finally, as a last touch, we can add a dark background. We used quite bright colors, so they will even look better with a dark background. Select the Rectangle Tool (M) and click anywhere on the working area. In the dialog box, enter the same Width and Height values as our artboard has: 800 px for Width and 1100 for Height. Click OK. Select the new rectangle and choose black as its fill color. Right-click on it and select Arrange > Send to Back. We are done! It might be confusing at first, but we simply worked hard on only one quarter of the design, and then we easily mirrored it three times. This way you can create fun designs for posters, greeting cards, invitations, gift wrap, and more. You might want to use a product template if you want to make a preview of your poster. I am sure you will find many fun purposes for this tutorial. Ivan Petrusevski aka Flim is a graphic designer and illustrator from Skopje, Macedonia. His main interest is character design and vector graphics. He is mostly influenced by editorial and cookbook illustrations from the 60's. Ivan started writing with Envato Tuts+ in 2013, with a focus on character design.